So I got to thinking about going back to basics, stripping away all the weapons systems, backpacks and triggered knockbacks, to see if WC3 can actually stand on its own out-the-box RPG-lite hind legs. 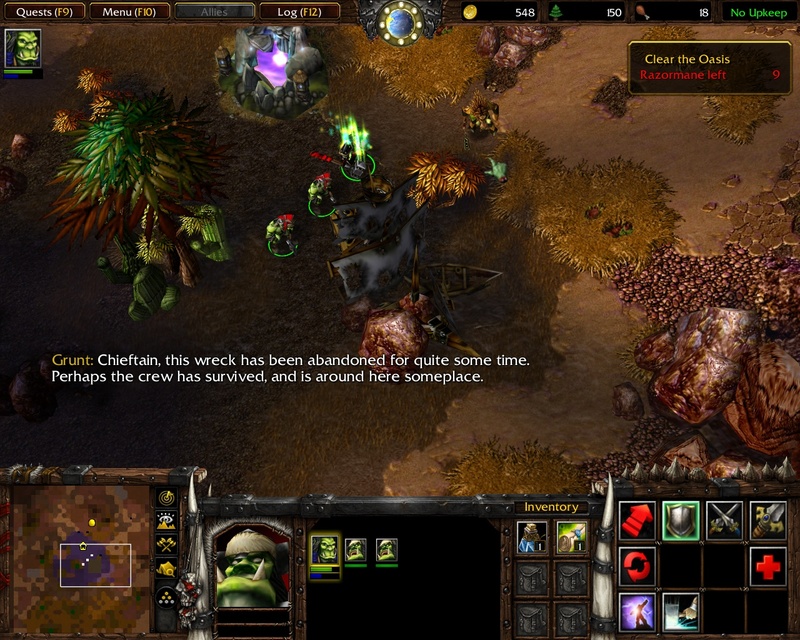 A long time ago, WC3Campaigns hosted a mini-mapping contest. According to the logs from that period, I spent 2 days on an entry called The Oasis before unceremoniously dumping it. The central tenet of this entry was using in-game dialogue to facilitate voiced cinematics, and I believe the contest demanded it be done in a 32×32 space. I have decided to take this project on again as the basis for this experiment. It would have been a candidate for The Forgotten, had it not been in quite such a broken state — only the first quest functioned at all — so I figured it might be worth finishing before chucking it out. The unfortunate downside of all this is that the scenario is Orcish and not Jaina. Okay, I’m not going to go totally import-free, but I’m not going to go overboard either. I’ve always said that the best imports are the ones you can’t distinguish from the in-game artwork, so I’m keeping it really down-low with a custom dismounted Thrall model (based on the Paladin). His abilities are mostly based on the Mountain King, as befits a fun loner — damage and hard stuns/horrendous slowing effects are simple but forceful and highly visible. The one concession to the other units and allies he sometimes finds himself around is a heroic version of Roar, while poor old Feral Spirit provides the fourth ability (I’ve fiddled with the wolves a bit, though). There are no ultimates for our player heroes, so I’ve raised the level cap to 12 to allow four three-tier abilities. I want the emphasis to be on actually using your abilities, rather than saving up an ultimate for the right moment and either never using it or having it locked away again for another five minutes. The oasis was once home to a mighty seafaring nation. The bulk of the imports are going to be bits of dialogue. Yes, the central tenet was to use only in-game dialogue, but then the story became just a little bit too constrained. With the judicious cutting and shutting of bits and pieces of existing Blizzard samples, I hope to assemble a few more unique and appropriate sentences to round things out a bit. I doubt I’ll end up with Deus Ex: The Recut, but neither do I intend to shy away from such surreality… If it feels right. I’ve also increased the size of the map. Not the playable area, which remains locked to the 32×32 square of the titular Oasis, but the unplayable edges — so you won’t be staring down at the black abyss at the bottom of the skybox. A little bit of summoning ensures that you don’t get too lonely. I’m aiming for about 25-30 minutes of gameplay, but so far it’s been pretty tough going. We all know that This Wreckage is artificially bloated by at least three hours of cinematic conversations, whereas here I don’t have the freeDom to ramble. The story is split into fairly discrete main quest elements bracketed by little cinematics, though each game part lasts far less time than I’d have hoped. At the moment I’m just about at the 20 minute mark… Though I guess adding VAT for not knowing the level should push it up to 30 minutes, at least for a first-timer (and replay value is not exactly a consideration here). In terms of gameplay, it is basically a linear dungeon crawl — except, since it’s a 32×32 square, the enemies come to you rather than you having to fight through them. 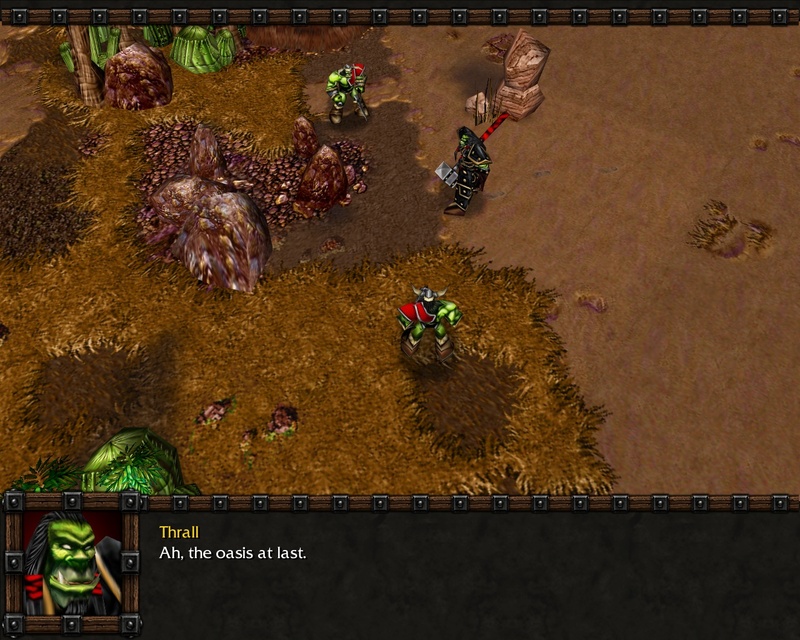 Various heroes and their armies try to take on the Horde and are successively beaten back; the only common objectives are that Thrall and the Fortress survive. Go home, Bloodfeather, you’re drunk. Well, I’m two planned quest phases from the finale, and I’ve only been working on it for a couple of weeks now. Maybe one more to polish it off and then we can talk about a release. On the other hand, I am starting a new job so let’s not make any hasty promises we can’t keep. Other quick experiments once this is done? 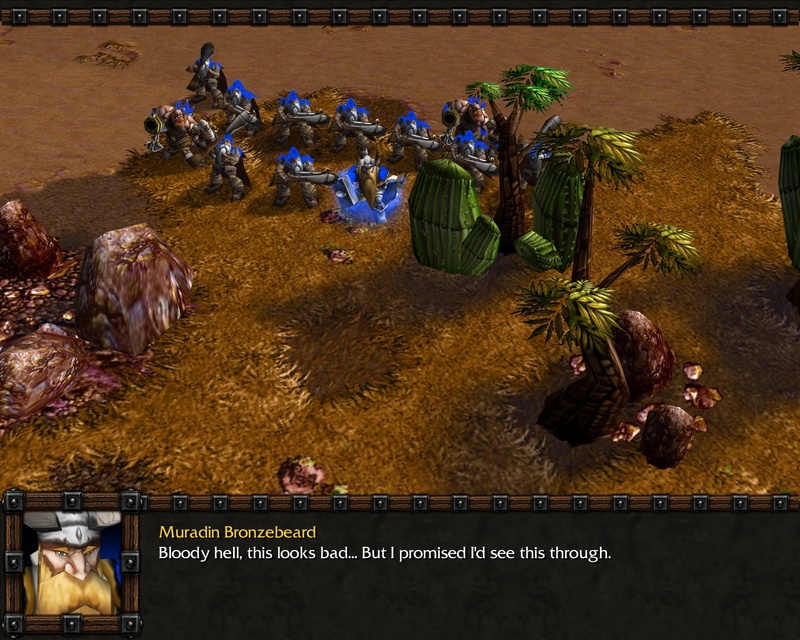 I know it looks bad, Muradin, but don’t judge a map by its pre-release authorial discussion, right? 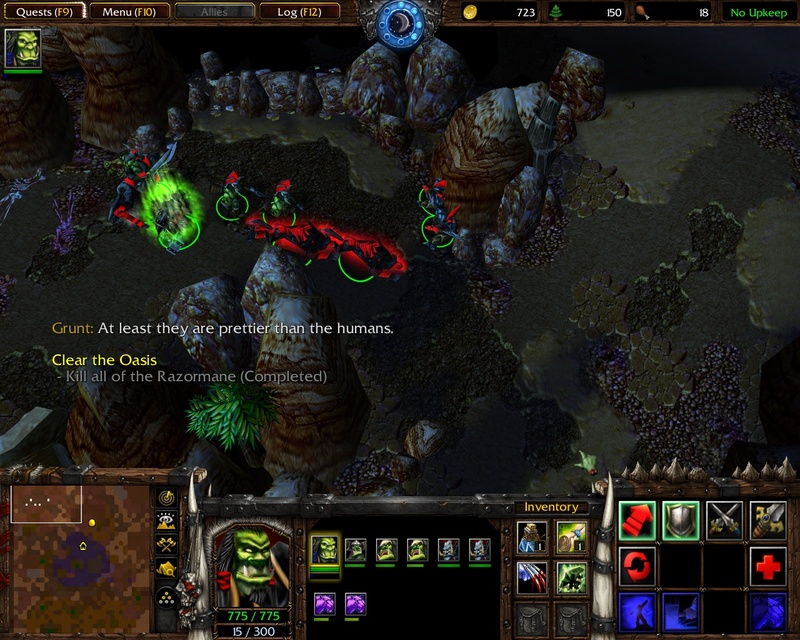 This entry was posted in Modding, Warcraft III and tagged back to basics, map, mod, oasis, RPG, singleplayer, Warcraft III by Rao Dao Zao. Bookmark the permalink. There’s a unprotected version of the Oasis map? I want to edit it in my WC3WE, but only for self enjoying, not for distribution. I’m afraid not. The triggerwork is… not my finest. I kind of like this, actually. 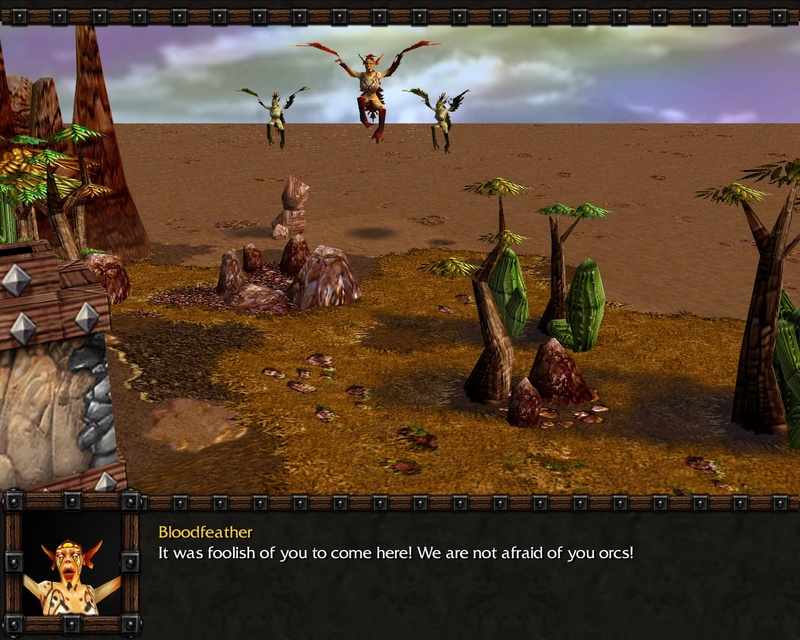 I remember a map very similar to this, where you defended a single spot with a footman, priest, sorceress, and archer. It was pretty beast actually, it’s amazing what you can make in a small sized map. Not to mention it’s much quicker to test a tiny map — no more 3-hour build-up to find a main quest near the end has broken!